The Addams Family has been a major influence in just about every form of media, beginning with Charles Addams' New Yorker cartoons in 1938. Most people know the macabre Addams' from the 1960s TV series that ran for two seasons but became a cultural phenomenon, launching multiple animated shows and a pair of live-action movies in the 1990s, the first of which was a huge hit. The second, not so much. 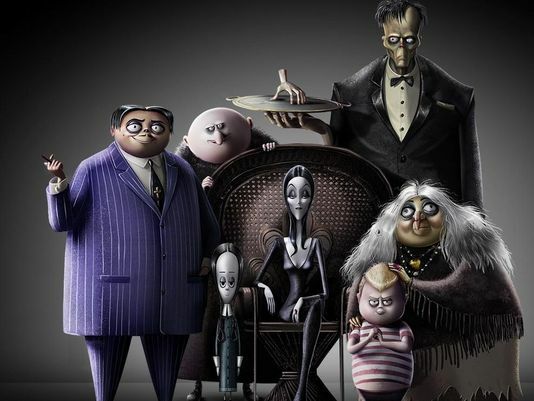 And now the creepy and kooky Addams clan is back with a new animated movie that features some A-list voice talent. Morticia, Gomez, Wednesday, Pugsley, Uncle Fester, Grandmama, and Lurch return for The Addams Family, and they are as strange and twisted as ever. "Strange, there's usually a murderous clown attached to the other end of these", says matriarch Morticia Addams to her daughter Wednesday about the red balloon she's holding. Oscar Isaac, Charlize Theron, Chloë Grace Moretz, Finn Wolfhard, Nick Kroll, Bette Midler, Elsie Fisher, and Allison Janney supply the voices, with Sausage Party duo Conrad Vernon and Greg Tiernan directing. The Addams Family was created as a dark twist on the ideal American nuclear family, and one of the cool things about them is seeing how they relate to different generations. The '90s film did a good job of fitting them into that moment and hopefully this new version can do the same. The Addams Family opens October 11th. Check out the teaser and synopsis below.